I got this Furcraea (I think) as an offset growing on a spent flower stalk at Disney during our honeymoon. I checked with one of the cast members and he said that it was okay, by the way. I rooted it in about an inch of potting soil and watched it grow at an alarming rate despite the fact that there was hardly any soil to speak of! This morning the plant became so top heavy that it actually fell out of the pot. Until I find a bigger container, I figure this recycled plastic one will do just fine. These are the super-cute containers that we purchased at Lowes the other day. 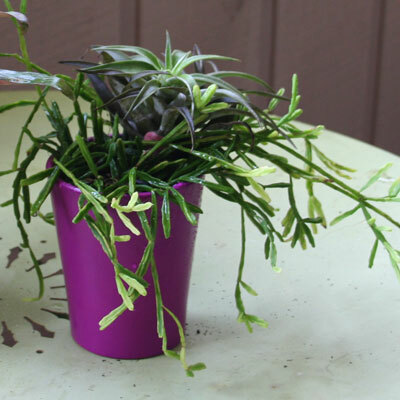 The little fuschia pot begged to be planted with something bright to set off the intense hue, so a rhipsalis hybrid made a perfect match. The tillandsia on top is normally white, but was recently watered so it looks gray in the photo. 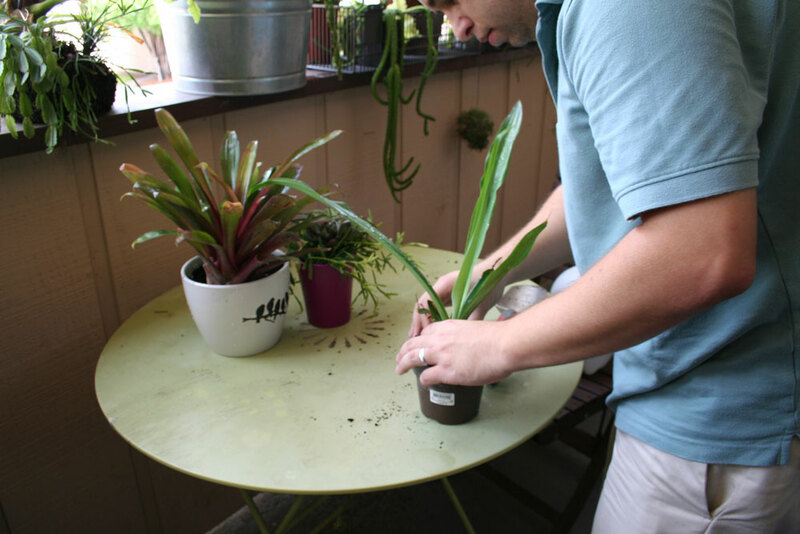 The large white container is an exact replica of the one adorning a dracaena in our house, but this one was planted with a purple leaved Vriesea sucrei hybrid to complement the small purple container. 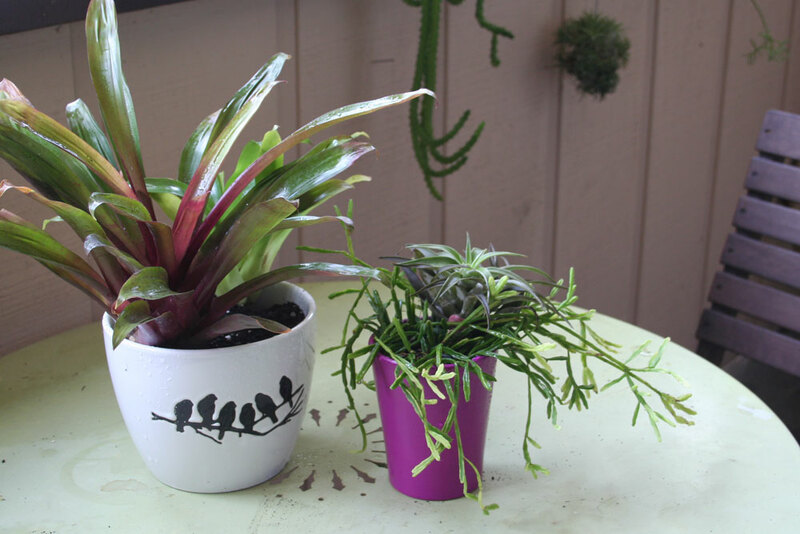 The white pot also pairs with the white (when dry) tillandsia. 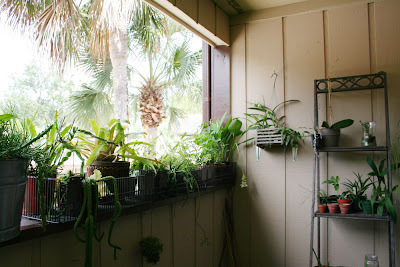 Here are some of the tropical shade loving plants on my balcony. I set some heavy metal baskets (freebies from work - were going to be trash) on the balcony ledge to organize my plants and to keep them from flying to their death on windy days. Those metal baskets aren't going anywhere! Once cooler weather arrives, the balcony will once again be the perfect place to write, read, draw and dine. A little sweeping wouldn't hurt either. i have that same little fuchsia pot from lowe's! the horticulture person there was throwing away some dead plants that were in them and told me i could have them for a quarter each. i probably shouldn't have mentioned that! hope yours were a good deal, too. i got a bunch of white ones and a red one as well. btw, your rhipsalis hanging out of the bird cage is so cool! love that. Oh I know! re-potting can create a mess cant it? I love that white pot. Your birdcage is stunning - I wish I could find some of that rhipsalis here - you do such cool things with it. Always fun to find new containers to love... and to get our hands in that wonderful potting soil! 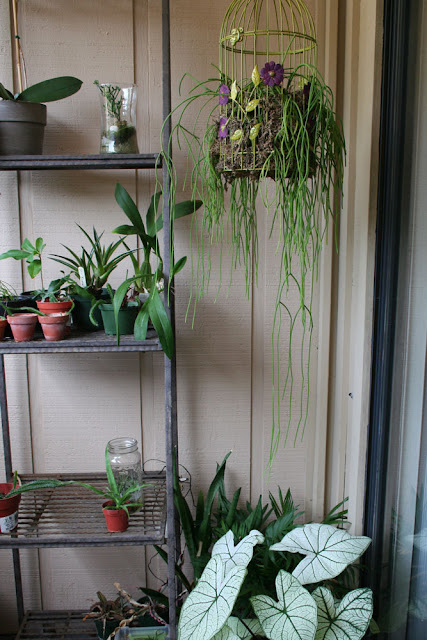 I'm re-doing some containers on my back porch this week, too. It's like making a flower arrangement only in dirt. Love those white caladiums making that corner shine! I always procrastinate with repotting. The local temperature is not always so conducive to being outdoors and when it does get low enough, the rains come. 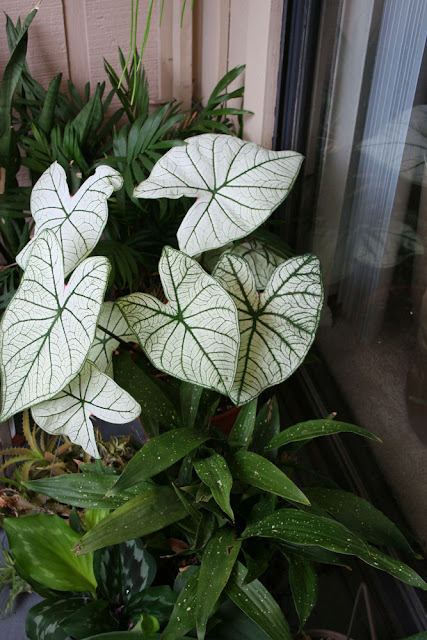 Agree with Meems on the white caladiums. Love those little planters, especially the one with a row of birds! Delightful. Whats the name of the white plant?